The PGDM and the MBA students of SCMS institutions recently went on their Out Bound Training (OBT) programme, which turned out to be an experience of a lifetime for them. The three-day training session comprised a number of activities that were designed carefully to benefit the students. Through the programme, the students learned a lot about management concepts, team spirit, crisis management, customer and public relationships, facing challenges and communication skills. The outbound experiential training programme is conducted for the students for nurturing team spirit and leadership skills in them. 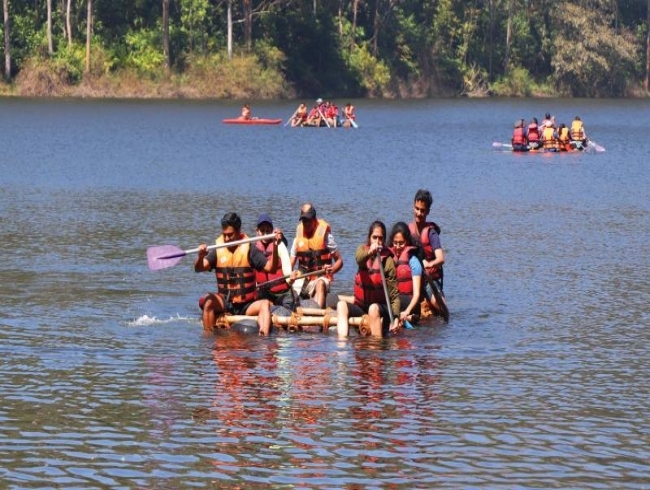 The OBT for SCMS faculty and students, involving camping, adventure, games and learning, was organised in Suryanelli and Munnar in collaboration with Kalypso Adventures. A variety of team games and competitive activities interspersed with discussions and deliberations on team dynamics and processes marked the programme. The events included a fun-filled exploration of various aspects of planning, collaboration, competition, creativity, communication, strategy and leadership in teams. Games like ‘High Ropes’, which is aimed at increasing the confidence level of the students and helping them overcome the fear of heights was the major attraction. All activities were designed in such a way that the students could understand the importance of leadership skills, team work and communication, decision making, integrity, ability to follow orders properly and utilisation of the resources effectively. Another objective of the training programme was making the students good listeners. The institute emphasises on giving its students practical training throughout the term.